I was up early well before the alarm and it was a nice morning. I was in the mood to hike and was hopeful to get some good trail to stretch my legs a bit today. 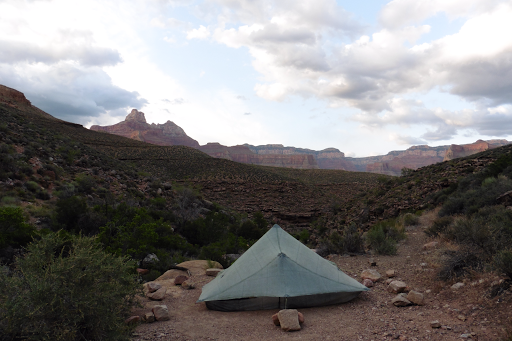 I also needed to set myself up for an easier final hike out and up to the South Rim tomorrow. I left camp at 6:30am and Gavin wasn’t far behind. Knowing we needed bigger miles today, we decided to both attack it on our own pace and routine. Gavin wasn’t sure how far he wanted to go, but I wanted to do a big mile day to be set up to hike to town tomorrow to then have a zero the next day. The whole day was spent up high on the Tonto Trail, which is also known as the Tonto Shelf. It was pretty cool and soooo level! The whole thing goes along a shelf that weaves in and out of all the side canyons. 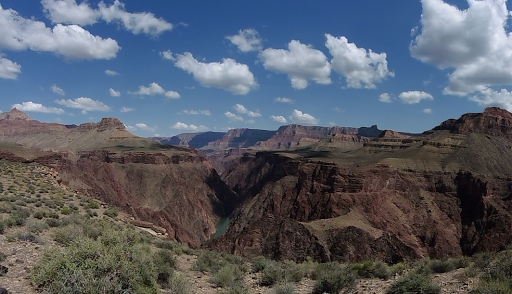 Every so often, there would be views of the Colorado River far below, but the trail mainly stayed well off the river and fortunately hit creeks that were still running in most the bigger side canyons. It was difficult to get photos today that really captures the enormity of it. 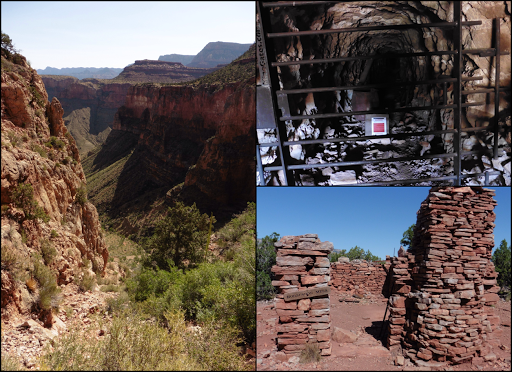 In the first photo, the Comorado is waay down in the center and the Tonto Trail is all along the right side edge there. 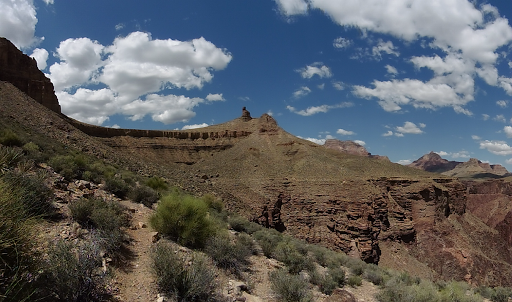 There was one eventful climb of like 1,500ft at Horseshoe Mesa. It was really steep and basically is part of the original route as a location for people to hike up to a cache they may have left themselves to resupply. There was an option to avoid this pointless and exhaustive up and down by taking the level Tonto Trail around the other side of the mountain, but I was stubborn and kept to the official route. Katherine is just less than a day ahead of us and it was good to see her footprints up there. She may not have been there in person, but she was there in spirit and misery loves company, so it made me smile. It was a mining area, so there was mining cave on the way up and an old building made of rocks up on top. Here’s the view from the top and some of the sites. After I came down and had lunch at a creek, I saw Gavin who had taken the level option (another reason we split today). He was not far behind and was finishing up his lunch so I hiked on and we figured that since the trail was level and fast miles today, we’d end up at the same place tonight. It was smooth sailing the rest of the day and I was on auto control. This has to be one of the smoothest days of the whole trail. The scenery was consistent and GRAND as would be expected today. Still so surreal to be in such a large place. 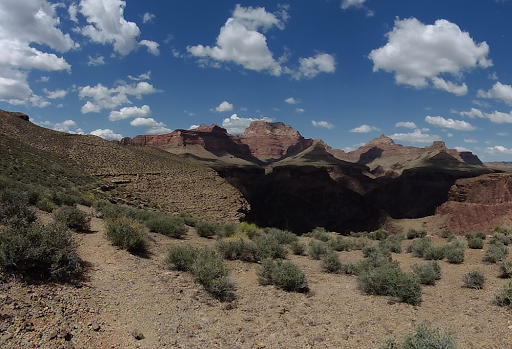 We’ve been in canyons and hiking along shelves of different types all trail, but nothing of this magnitude. So cool! I loved the solo time and do really miss having that so far this summer. It was a great recharge to get a day back on my full routine and in a solo space. There’s definitely a give and take pairing with others and it was just great to do my thing for a day. There’s hardly anyone on this trail, so it felt like I had it all to myself and that was really nice. I was in audiobook mode most of the day, which also hasn’t happened much out here. The navigation and physical effort of much of the Hayduke hasn’t allowed for much headphone time and I’ve missed that too. I finished The Rosie Project, which was cute, but much like the movie, As Good As It Gets, so I’m sure it will be a film in the near future. I then started a novel called We Are Not Ourselves and I’be really enjoyed it so far and am close to being hooked to knowing what’s going to happen, so I hope I get more time to listen in the final two weeks out here. 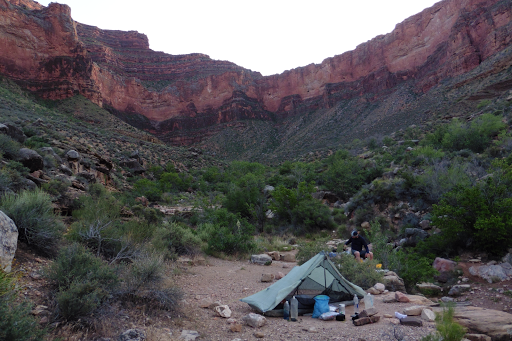 Today flew by and I got to a fantastic campsite next to a small creek at 5:40pm. That was well before my regular stop time, but it’s was too good to pass up and no one else is here. The next area is closer to the rim and would allow for an easier hike out, but we are ahead of our permit and that area is more strictly patrolled by park rangers. Gavin arrived about an hour later and we are both really happy with the spot. It was mid 80s today and there was a nice breeze, so it was enjoyable. Right now, clouds have gathered again and there’s no telling if it might rain, but I love the view and having clouds in the sky. We have had wonderful weather and beautiful clouds each day to enhance the scenery. 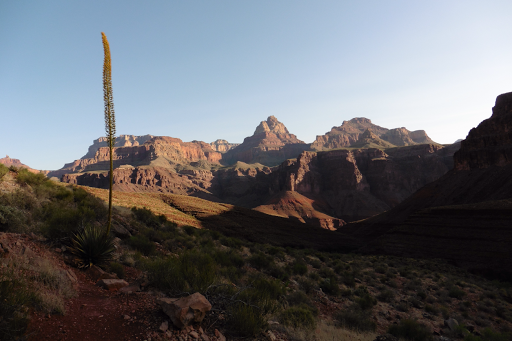 Really, just the perfect Grand Canyon introduction! Poor Gavin has continued his leg of losing things and lost his camera!!! I swear, I feel like I’m contagious. He camps without mesh, so last night when there was a lot of blowing sand and bugs, he threw everything in dry bags in the dark. He noticed he didn’t have the camera this morning, but assumed it was in a dry bag in his pack and that he’d get it out later. Nope, somehow gone. Good news is that he had loaded all his photos onto his laptop like I did in Kanab and he’s in most the photos I’ve taken since. Bad news is that it was before the Buckskin Gorge when I also lost my camera, so now neither of us have photos of the first day in the Buckskin. Good things I took photos of the ones on his camera back when it happened! Poor Gavin. He did find a camera yesterday, so I’m encouraging him to use that one while he looks for the owner.